The shoulder complex is one of the most vulnerable areas in the body. Without proper strength, endurance, flexibility, and mobility exercise, the shoulder area is prone to injury, mobility issues, and chronic pain. Issues and injury in the shoulder can have profound impact on functionality and activities of daily living, causing pain and loss of optimal range of motion. This course will help you understand the importance of multiplanar training for the shoulder joint. Adding resistance in all planes of motion and in multi-planar motion will help train the shoulder joint functionally through many ranges of motion. By adding appropriate resistance for the multiplanar exercises, you can help increase strength and endurance. Identify 4 terms and 5 variables related to muscular fitness and overload. Identify the FITT-VP guidelines for resistance training. Describe the anatomy of the shoulder complex. Discuss 4 planes of motion and how they relate to 7 movements at the shoulder complex. 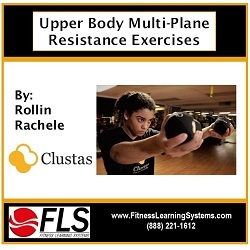 Explain how to safely and effectively perform 11 resistance exercises for the shoulder complex.